Clay is one of the few materials with no apparent value of its own in a raw state; yet it can be made into valuable objects. The value is put there by the potter. Clay admits of a spontaneous rapid intuitive method but does not tolerate carelessness. Pottery seems to have a value, which is quite beyond the sum of its usefulness and beauty. There is in pottery a thread of connection with the earliest traditions of civilization and culture. Pottery forms, even simple ones like cups or plates, still symbolize for us in a particularly direct way, some of the most fundamental human activities. Many ordinary pots, including those with no special claim to distinction seem to share something in common with the greatest examples of craft, which have been the vehicle for fantasy, humour, symbolism and sculptural invention. As well as for the more mundane practical needs of the kitchen and table. Pottery is one of the first household or useful arts. Each piece of Leishman stoneware is handcrafted using all natural ingredients. It is then fired to 2300F with food safe glazes. Stoneware is a hard, strong and vitrified ware. The glaze and clay, when they reach this temperature at the same time, form an integrated body-glaze layer. 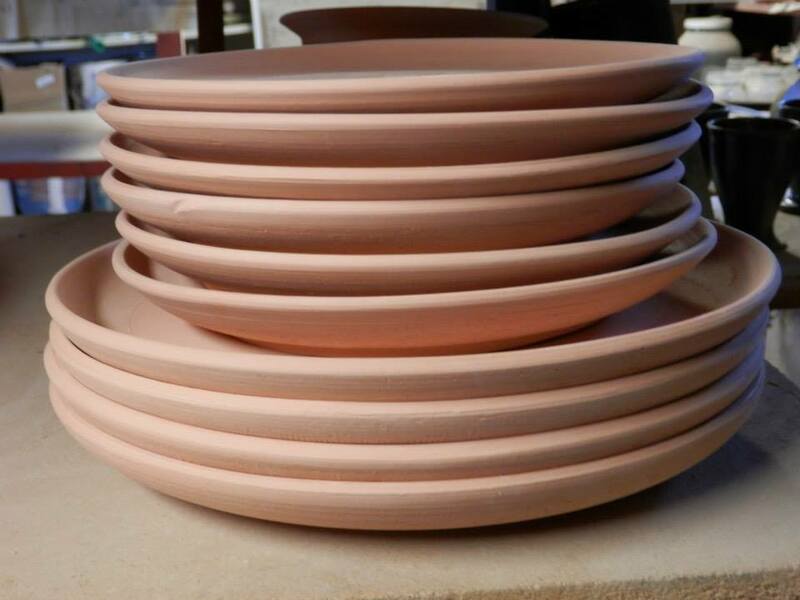 Our clay supplier for the last 35 years has been Tucker’s Pottery Supplies in Richmond Hill, ON. All our clay is Alberta based. The glaze ingredients come mostly from North America. Some mines close, some ingredients become harder to find. Frank Tucker helps to keep that supply chain running. Nature and chemistry affect the beauty of each item. Small blemishes and marks may occur, but in no way will they affect the integrity of the piece. Thermal Shock is stress caused within a ceramic object by temperature change. If there is a large difference in temperature between two parts of the same piece of ceramic (i.e. the bottom of the pot on a burner and the sides not on a burner or frozen food inside the casserole which would remain cold while the pot heated up), there is obviously a size difference due to expansion and contraction. This is the cause of the stress. In order to avoid thermal shock, which results in the cracking of your pottery, all teapots should always be preheated with hot tap water before adding the boiling water. Casseroles, and any item to be used in the oven should be at room temperature before being put into the hot oven. If you have frozen food in the casserole dish, do not place it from the freezer directly into the oven, but allow it to attain room temperature first. No pottery of any kind should be placed directly onto the stovetop burner. 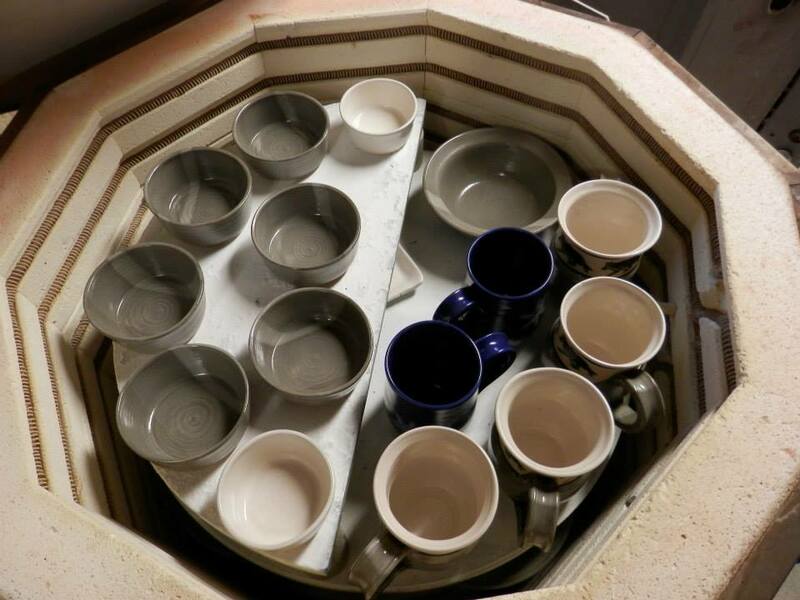 These precautions are again to avoid thermal shock, which results in the loss of your pottery. With a minimum amount of special care to avoid thermal shock, you will ensure years of continued use. No lead is used in our pottery. To go through your life as a maker of things, a potter, artist, must feel comfortable in their medium as well as their artistic cravings being fulfilled in using their medium. 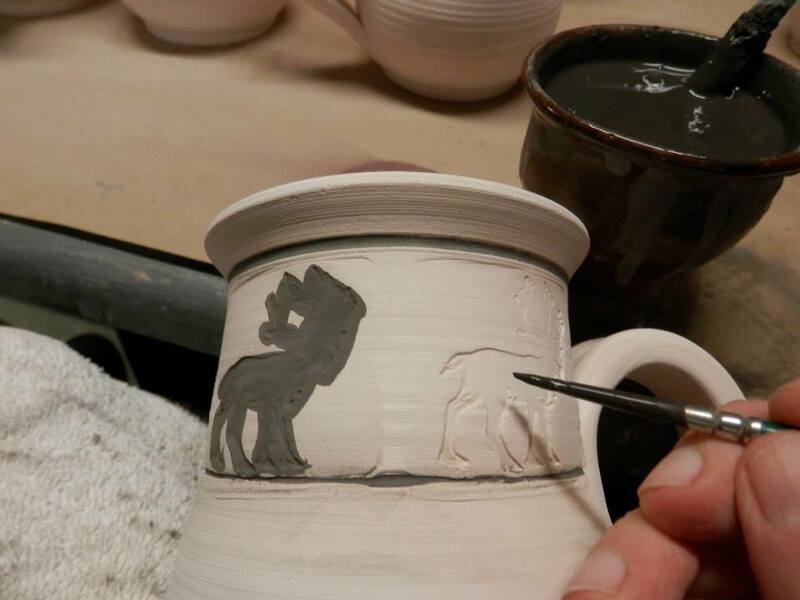 Pottery is our medium. After 38 years of marketing, the Leishmans have realized that the mug has become a large part of their trade. Mugs, steins, and more mugs. Mugs with faces, mugs with animals, insects and trees. Plain mugs, fancy mugs, thousands of mugs per year. Leishman Pottery has made over 70,000 forms of a cup in the last 38 years. We may already be in your cupboard. What’s so special? Your mug is special. Your favourite mug, from the first sip of coffee in the morning to the last cuppa, late at night may contain an inspirational liquid or it may be a Pavlovian response. Either way, lively conversation, memories and that warm fuzzy feeling come from your mug. With all this in mind, the Leishmans want to be part of your warm and fuzzies. We feel comfortable in our role as facilitator of liquid influenced dreams. Please enjoy.